Since this is an introduction to electrical filters, we’re going to keep it simple and talk about basic passive analog filters. We’ll see a little bit of math, but leave the transfer functions, poles, zeros, Bode plots, and Laplace transforms to the engineering books and professors. Filters have been an integral part of electronics for a long time. In fact, several technological achievements wouldn’t be possible without them. A filter is a frequency selective device. In other words, filters allow certain frequencies to pass through, but block others. They “filter out” the frequencies we don’t want. Another way to state this is that filters attenuate some frequencies more than others. By attenuate, we simply mean to reduce in amplitude. This has the effect of blocking signals we don’t want while passing the ones we do. Both of these electrical filter types are quite common. We won’t go into any detail on active filters here, but let’s quickly touch on the difference. Common passive filters are unpowered and consist of things like resistors, capacitors, and inductors. Active filters use some sort of amplifier, usually an op-amp. Because of this, an active filter can have a gain greater than one while a passive filter has a maximum gain of one (a.k.a. unity gain). In reality, passive filters have a gain of less than one due to losses in the components. This article will focus on passive filters because they are simpler and easier to understand. Before we dive in and take a closer look at some basic filter types, it will be helpful to understand some common filter lingo. We now know that electrical filters attenuate and block certain frequencies while passing others, thus effecting the signal’s amplitude. This is the filter’s frequency response. The frequency response is usually given in a graphical form like figure 1. Figure 1: frequency response of a low-pass filter. The figure above brings us to our next term: cutoff frequency. This term has several aliases including corner frequency, 3-dB point and half power point. Let’s talk a bit more about the last two. First, if you’re not sure what a decibel (or dB) is, check out All About the Decibel where you’ll get some answers. If you already know this stuff, then keep reading. The horizontal red dashes represent the 3-dB point (a.k.a. cutoff frequency). This is frequency at which the output power of the filter drops about 3-dB (actually it’s 3.01- dB, but we round it). A decrease in power of 3-dB cuts the output power in half, hence the other name – half power point. Another interesting thing to note about this point is that the output voltage drops to 70.7% of its original value. The filter’s roll-off describes the steepness of the drop after the cutoff frequency. In a perfect world, a filter would have a totally vertical roll-off. In reality that never happens. Roll-off is given in dB/octave (doubling of frequency) or dB/decade (ten times the frequency). Filters also have an input and output impedance. To get the best performance, the filter’s impedance should match that of the circuit it connects to. Anyone order a filter? Seriously, the filter’s order describes the number of RC or LC pairs in the filter. In general, higher-order filters have better performance and come closer the ideal vertical roll-off. Of course, filter design — like most things in life — is a series of trade-offs. Stacking several RC or LC pairs together to create an 18-th order filter not only totally complicates things, you also reach a point of diminishing returns. Figure 2: a second-order low-pass filter. Notice there are 2 RC pairs. We’ve already established that there are many, many types of filters, even if we limit ourselves to passive analog filters. Of the crowd, there are four basic types. Figure 1 depicts the frequency response of a low-pass filter. As you may have guessed, a low-pass filter passes low frequencies and blocks higher frequencies. An ideal LP filter would look more like a square or rectangle, but like we said before, there is nothing perfect in this world. Because of that, low-pass filters have a response that looks something like figure 1. Figure 3 depicts the actual circuit. Let’s talk about that circuit for a minute. Figure 3: a basic low-pass filter. Capacitive reactance is inversely proportional to frequency. In other words, the higher the frequency the lower the reactance. At 0 Hz (DC) a capacitor is like an open circuit, so all the voltage appears across it. At slightly higher frequencies, most of the voltage drops across the capacitor due to its high reactance, thus passing low frequencies. This is because the capacitor and resistor form a voltage divider and at low frequencies the capacitive reactance is large compared to the resistance of the resistor. If you’re unfamiliar with the term reactance, just think of it as a frequency dependent resistance. When the frequency increases, more voltage will drop across the resistor and the capacitor will start to behave more like a short circuit. Basic circuit analysis tells us that there is no voltage drop across a short circuit, thus there will be no output at higher frequencies. This is how a low-pass filter attenuates high frequencies. In case you care, the formula for capacitive reactance is given in equation 1. We can plainly see that it is frequency dependent and that the higher the frequency gets the lower the reactance gets. Where f is the frequency and C is the capacitance. A high-pass filter does the opposite. It will block low frequencies and pass high ones. Figure 4 depicts a high-pass filter circuit. Figure 4: a basic high-pass filter. At low frequencies the reactance will be high and almost all the input signal will drop across the capacitor. Because of this, low frequencies will be blocked. As the input frequency increases, the reactance decreases, allowing more of the input signal to pass through. A good way to remember the difference between the two circuits is by noting the position of the capacitor. In a low-pass filter the capacitor is in the lower position relative to the resistor, in a high pass-filter it is in the higher position relative to the resistor. Figure 5 gives the frequency response of a typical high-pass filter. Figure 5: high-pass filter frequency response. A band-pass filter passes a certain band (group) of frequencies between a lower and upper cutoff frequency while attenuating others. To see what I mean, feast your eyes upon figure 6, which shows the frequency response of a band-pass filter. Figure 6: band-pass filter frequency response. There are a few things to point out about the figure above. First, the bandwidth (in the darker color) is the frequencies that the filter passes. It is equal to fH minus fL and is dependent on the design of the filter. fH and fL are the high cutoff frequency and low cutoff frequency, respectively. Second, this filter has two 3 dB points or cutoff frequencies. Next, notice the labels on top of the picture. This filter has two stop-bands and a pass-band. More filter lingo. Finally, the slope is a synonym for the roll-off we talked about earlier. 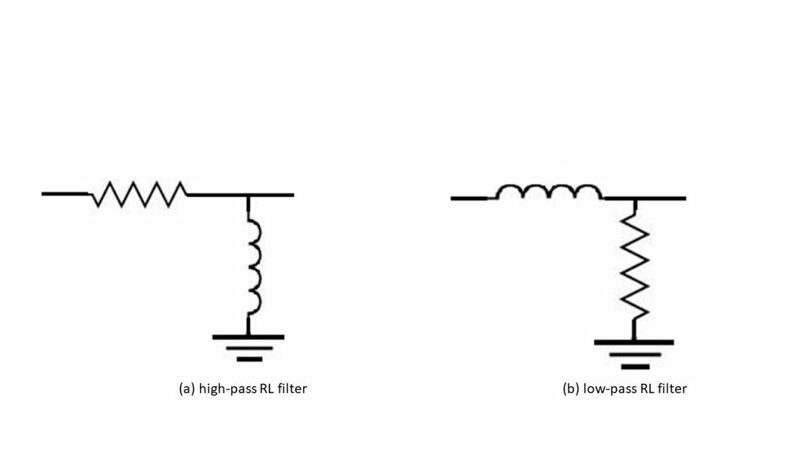 To make a band-pass filter, all you basically need to do is put a low-pass filter in series with a high-pass filter. Figure 7 illustrates this. Figure 7: a simple band-pass filter consists of a low-pass filter in series with a high-pass filter. The output is taken across resistor R.
For example, if we need to make a filter that passes frequencies from 10 kHz to 50 kHz, we can just put a 10 kHz high-pass and 50 kHz low-pass filter together. A band-reject (a.k.a. notch, band-stop) filter is the opposite of a band-pass filter. Its job is to reject a certain (usually narrow) band of frequencies while passing others. The reject band is often somewhere in the middle but doesn’t have to be. Figure 8 illustrates the frequency response of a typical band-stop filter. Figure 8: band-stop filter frequency response. To build a notch filter (there goes more filter lingo…) we need to gang a low-pass and a high-pass filter together in parallel. Taking our previous example, we can build a 10 kHz to 50 kHz stop-band filter by putting a 10 kHz low-pass and a 50 kHz high-pass in parallel. 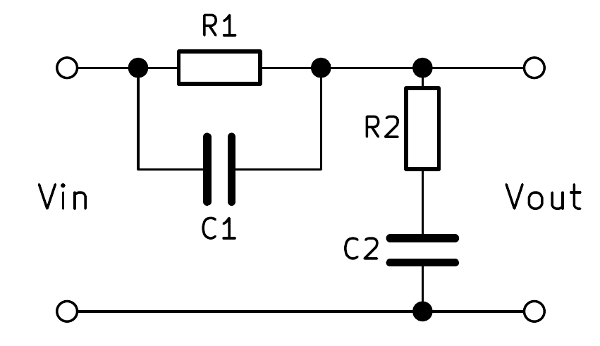 Figure 9 depicts the circuit of a simple notch filter. Figure 9: a simple band-stop or notch filter. It’s a bit harder to visualize the connections, but the two filters that make it up are in parallel. Electrical filters can be made from RC, LC, or even RLC pairs. At this point, you may be asking yourself something like where are all the inductors? Or, why do we keep using capacitors and not inductors? Some filters do use inductors. In fact, any of the four basic filter types can be made using inductors, though the circuit layout will be different. Consider the filters in figure 10. The main thing to notice is that the inductor is in the opposite position for a given filter than the capacitor. For example, part (a) shows a high-pass RL filter, but the notice the output forms across the inductor whereas in an RC high-pass filter the output forms across the resistor. Just as in RC filters, the inductor and the resistor form a voltage divider. But inductive reactance is proportional to frequency, unlike capacitive reactance. Because of this, the inductor drops less voltage at lower frequencies. If the input frequency is low, the inductive reactance will be low, so (in the case of a low-pass RL filter) the resistor drops most the voltage. Therefore, the output of a low-pass RL filter is taken across the resistor. When the frequency increases, the inductive reactance kicks in and drops most of the voltage, thus passing high frequencies. In case you care, the formula for inductive reactance is given in equation 2. Where f is the frequency and L is the inductance of the inductor. But Why Aren’t RL Filters as Common? We’ve already alluded to the fact that RC filters are used more often then RL filters, though there are some applications where RL filters shine. The reason for this is that inductors are big, heavy, bulky items. They can also be expensive items. Capacitors — on the other hand, are light, small, easy to make and cheap. Therefore, you’re more likely to use RC filters in your applications than RL filters. At this point you may be asking yourself how to pick the values of R, C, and maybe L.
Volumes can (and have been) written on filter design, even if we just limit ourselves to passive analog filters. Being an introductory post, the point here is to cover the foundation for those who are new to filters or need a review of electrical filter basics. We’ll cover more specifics on passive analog filter design in a future article. We’ll also talk about active filters and even digital filters eventually in separate articles. Until then, comment and tell us about your level of experience with filters (any kind). Maybe you can help write the next article! Good article for the basics. I’m no filter expert, but have some experience. Love to see a follow up on active filters and digital filters. Thanks Phil. Keep your eyes peeled for more filter related posts in the future. Thanks a lot. really useful info. i ve been searching it. didn’t work with the filters, because i thought that they need only for hand-made radio receivers. Glad you enjoyed it. Filters, though now often digital, are still very important in the realm of electronics. I’m curious, when it comes to electronics what are your main interests?